Wildflowers in a native garden are one of my favorite plantscapes of all time. 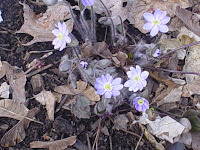 Hepatica acutiloba, Liverleaf, is the first to bloom in my garden and one of the most delicate. These dainty but rugged little plants are native to the Northeast and are often seen in deciduous woods. 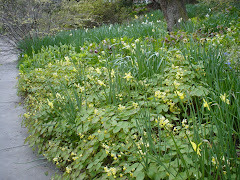 They like dry shade and fertile soil and are cold hardy in zones 5 thru 8. Your local better garden center might have these plants for sale, or they can order it for you from Behn's Best Perennials in Chatham, NY. Heronswood is a good source for them if you prefer to buy online.